An international festival highlighting the best and most imaginative theatre for children is coming to Birmingham this summer and features 16 shows from 14 countries. On The Edge is the 2016 World Festival of Theatre for Young Audiences, which takes place for eight days only from July 2 to 9 with many free shows to enjoy at venues like Birmingham Repertory Theatre, mac Birmingham in Edgbaston and The Patrick Centre in Birmingham Hippodrome. Birmingham Repertory Theatre is the main festival hub for the event that treats families to shows from as far away as Burkina Faso, Australia and South Korea. It's the first time that the UK and Ireland have hosted the festival and the festival programme includes premieres, dance, comedy, horror and even events suitable for 18-month-old babies. There are also workshops and specific shows for Birmingham schools. UK premieres include the popular Burkina Faso tale, Why Do Hyenas Have Shorter Back Legs Than Front Legs and Why Do Monkeys Have Bare Bottoms? by Seydou Boro Company. There's also Reinräumraus - an imaginative piece for two-year-olds by Austrian puppeteer and actress Myriam Rossbach. There's also the first chance for British audiences to see the musical fable, A Feast of Bones, which is a retelling of classic tale Henny Penny by Irish company Theatre Lovett. Also from Ireland is Losha, a rich and thoughtful play about a magical creature filled with poetry and dance. 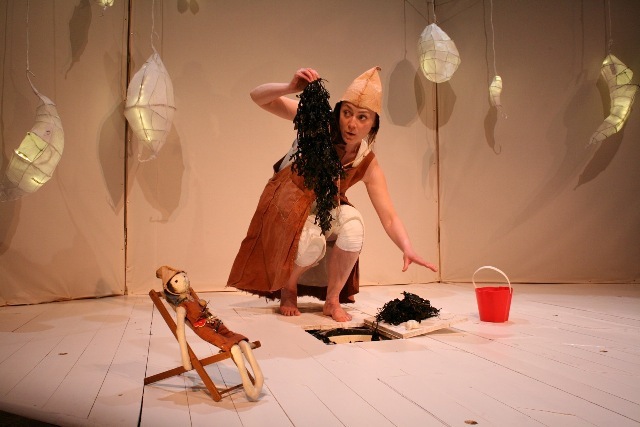 The show combines shadow play and puppetry from pioneering children's theatre company Monkeyshine. Other festival highlights include The Hamilton Complex by Belgium's leading theatre for young people HETPALEIS, which takes you inside the chaotic mind of 13 teenage girls, caught between childhood and the adult world. A live interactive public artwork - I Think I Can - gets children more involved with what's happening and has been created by Australian company Terrapin Puppet Theatre, which invites members of the public to become residents in a miniature model railway village. It uses puppetry, live video and active audience interaction. The Curious Scrapbook of Josephine Bean, meanwhile, is a charming, gentle detective story by Scottish artist Shona Reppe that delves back in time into a scrapbook's history. 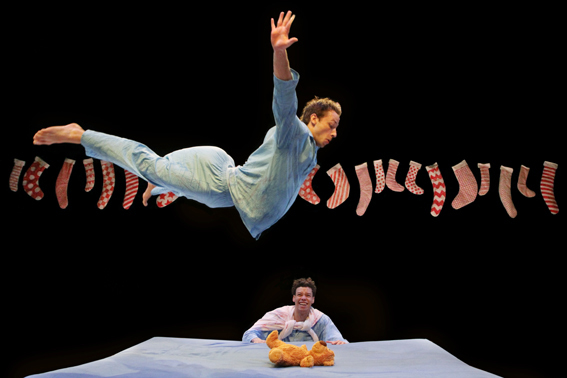 British theatre company Travelling Light show the delirious excitement of two brothers waiting for Santa to arrive on the most magical night of the year in Boing! using dance and drama. There's humour along with horror in Nosferatu from spooky storytellers Bob Théâtre; a raw and gritty hip hop gig from 20 Stories High in The Broke 'n' Beat Collective; while Pim and Theo is an immersive show about culture and identity. For babies and toddlers, there's Out of the Blue from Theatre Iolo. The Broke 'N' Beat Collective uses hip hop as part of its entertainment at On The Edge festival. Children will be treated to a visual and inventive show that brings paintings to life in Brush, while there's a funny and moving true story of a Jewish family living in 20th Century London in Breadˆuses' Wot? No Fish!! Two shows will be specifically performed for schools. They are Bliss – a unique immersive adventure created for children and young people with profound and multiple learning difficulties by Replay Theatre Company; and Katie's Birthday Party, which looks at the trials and tribulations of what a young person goes through in the change from primary school to secondary school by Mary-Frances Doherty. Venues across Birmingham - the festival hub is at Birmingham Repertory Theatre on Centenary Square. Tickets from the On The Edge website. I Think I Can is an interactive model railway installation that invites members of the public to engage and play by becoming temporary residents via a tiny puppet. Through puppetry, live video, and audience interaction, this innovative public artwork asks "what would you like to be today?" engaging participants in an optimistic task of collective storytelling that deals with dynamic notions of residency and responsibility. Join brothers, Wilkie and Joêl, in the delirious excitement of waiting for Santa to arrive on the most magical night of the year. Too agitated to sleep, the boys are drawn into ever more exhilarating games that turn their bed into a giant trampoline! A delightful and inventive family show direct from South Korea. Paintings are created live on stage and brought to life before your eyes to tell a bewitching story filled with weird and wonderful characters, live music, dance, fanciful puppets and a company of engaging performers. The clues are in its pages. Everything is flat, pressed, squished. Slowly, page-by-page, the scrapbook becomes the window into a secret world and a curious life unfolds before us - but who was Josephine Bean? Out of the Blue is a perfect introduction to live theatre – full of captivating images and intriguing sounds - followed by an opportunity for the babies and toddlers to play too! Two men were shot in cold blood on the streets of Holland. Victims of extremism, Theo Van Gogh and Pim Fortuyn weren't afraid to make their opposing political views known. Incorporating sound and film design as well as live performance, four European theatre companies join together to make Pim & Theo – an immersive theatre show about culture and identity, life and rules and the limits of tolerance in our society. Unconventional French theatre-makers, Bob Théâtre, bring humour, horror and an inventive use of light bulbs to ON THE EDGE. Are you brave enough to meet our spooky storytellers? Come and spend an evening with The Collective; a raw, gritty, funny and moving Hip-Hop gig that explores the hardships faced by young people in the UK today. A unique mash up of hip-hop, theatre and puppetry bringing together four amazing artists: beat-boxer Hobbit, b-boy LoGisTics , puppeteer Mohsen and, from the Midlands, singer/rapper Elektric. Produced by HETPALEIS, Belgium's leading theatre for young people, thirteen girls reveal what its like to be on the precipice between youthful innocence and adult sexuality. With names like Charity, Prudence and Destiny, the girls tell horror stories, they sing and dance to music from Joan Baez to hip hop and Les Choristes, they talk, they rebel, they flirt and they play. They demand your attention. Both visually kitsch and profoundly emotive and powerful, this cracker of a play" (DE STANDAARD), shows how tough it is to find your place in a tough world, testing boundaries, staking your individuality, wanting fun. When everything is changing. When you're 13. The show is a feast for the senses filled with poetry and dance, shadow play, puppetry and projection. Losha is a rich and thoughtful play that captures the heart and stirs the memory. Having just moved school but not quite a teenager yet, Katie reflects on times gone by and looks to the future and all it can be. There will be truths, there will be dares, there will be presents and there will be cake! Solo performer Mary-Frances Doherty explores notions of childhood on the approach of adolescence, looking at the trials and tribulations of what a young person goes through in the change from primary school to secondary school – exams, results, new school, new friends, thoughts for the future. Wot? No Fish!! tells the true story of a Jewish family living in 20th century London. From falling in love to quarrels about fish balls, audiences are taken on a funny and moving journey against the backdrop of a changing city. In 1926 shoemaker Ab Solomons drew on the wage packet he gave to his new wife Celie. Throughout their marriage and into the 1980s, Ab drew or painted on his wage packet every week for her. These illustrations depict, with remarkable honesty, the ups and downs of their life together. Years later, Danny Braverman discovered the lost art of his Great Uncle Ab on 3,000 wage packets. Now the story is brought to life on stage in this captivating performance. It smells tasty in the kitchen. Pots and pans are spread about. The eggs and the flour are ready too. After shaking and mixing, rolling and battering, something delicious appears on the plate. Myriam Rossbach, puppeteer and actress of this production, engages with objects and breathes new life into the kitchen. She uses kitchen utensils in unconventional ways, gets them to dance and even lures a tune or two from the pots and pans. A gentleman dines at a fine French restaurant – but at Le Monde Bouleversé you never get quite what you expect. A Feast of Bones is dark musical fable set in the shadows of World War I, featuring live music and an original score. Theatre Lovett bring their characteristic edginess to Walter de la Mare's retelling of the classic tale of Henny Penny. Why do hyenas have shorter back legs than front legs and why do monkeys have bare bottoms? A popular tale from Burkina Faso about authority, cunning, conceitedness and consequences is brought to life by five dancers within a beautiful African-inspired set. To recreate the wild and fantastic ambiance, the performers wear animal masks made in the country. Journey through this magical wild world, where it all begins with "Once upon a time…"!